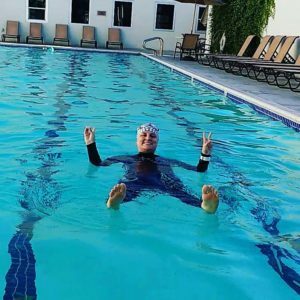 Back in May of 2016, I had a wetsuit emergency. Okay not really an emergency, but I needed a wetsuit for a race ASAP and I didn’t want to spend a ton of money. 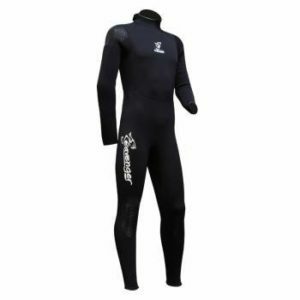 After a few hours of searching I found the Seavenger Wetsuit on Amazon. And while it is not specifically a tri suit, it fits all of the USAT standards, was the right price $57.99 and I could get it delivered in one business day. Sizing – Go down a size when ordering. I ordered according to the sizing specifications on Amazon, but my muscle to weight ratio must be higher than the models they used to create their standards. The first suit I got was too large, so I ordered a size down and it fit perfectly. If you have muscle, size down! Value – At under 60 bucks, this suit is awesome. You won’t find a new tri wetsuit for under $100 and you certainly won’t find one with this level of flexibility. The Fit – The suit itself is snug, but not overly compressive. There are bands at the wrists and ankles to keep water out and the neck (like all wetsuits) is fairly snug. 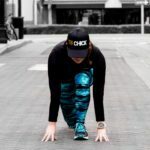 Getting it on/off – I’ve read plenty of stories from triathletes comparing getting their wetsuits on to a fourth event, so I was prepared for the worst. However, this suit is SUPER easy to get on and off. I got it on in about a 2 minutes and easily zipped myself up. Getting it off was even easier. It may not be a high tech suit, but the ease of getting in and out of it is a plus in my book! Flexibility – True to their claims, this suit is SUPER flexible. 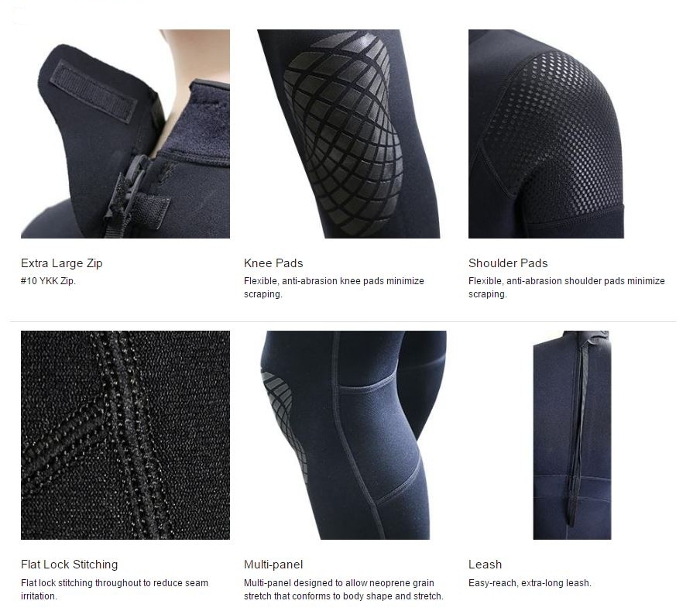 The flexible shoulder pads and super stretch armpit panels really do help. I did not notice any decreased mobility with the suit on. 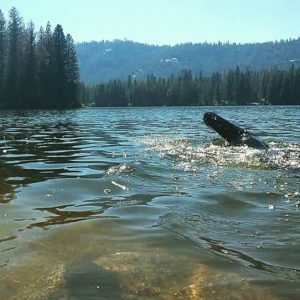 My arms moved freely through the water and my open water pace with the suit on was similar to my pace with just a tri suit. Float and Warmth – With 3mm of neoprene you float easily in this suit. The suit keeps you warm, but you won’t get as hot as you do in a 5mm suit. It is suitable for swims of 60F and up. Cons – The only downside to this suit is that it lacks the special slick coating that most tri wetsuits come with. 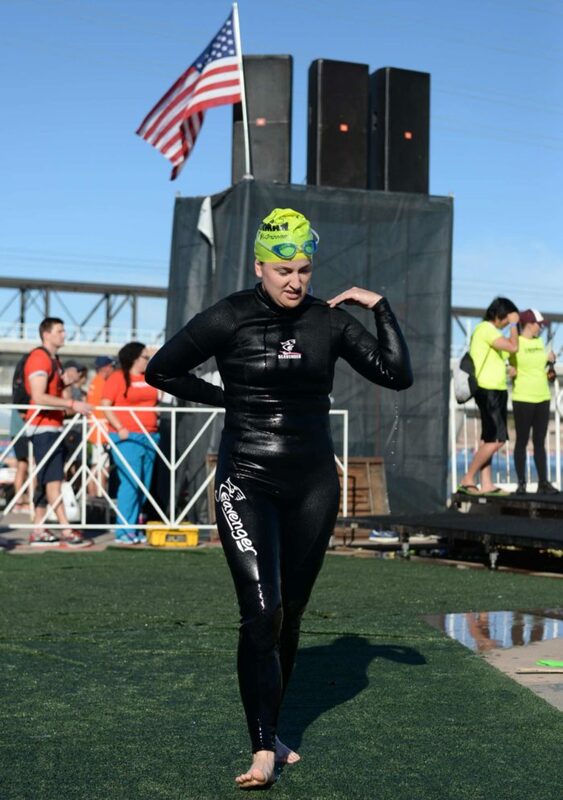 The coating reduces drag, so my suit probably had more drag than the average tri wetsuit would. That being said I didn’t notice any significant drag and my pace was similar to my normal open water pace. 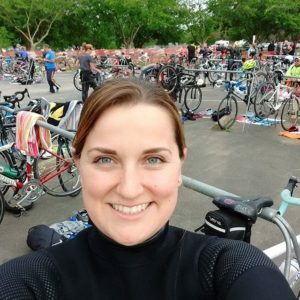 Using the suit during a sprint tri in May. Testing the suit out at a local pool. Looking for this suit? Check it out on Amazon.